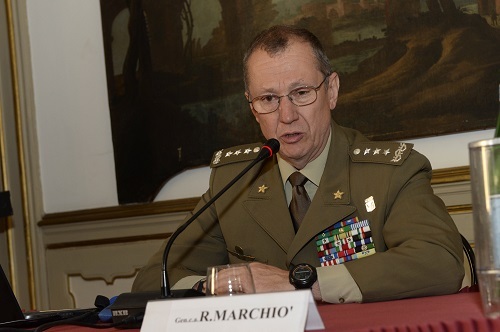 NRDC-ITA NATO - 4th May- "Soldier of peace"
NEWS > ARCHIVE > Archive 2016 > Archive 2016 - 05 > 4th May- "Soldier of peace"
Today, at the “Press Club” in “Bocconi” Palace, Milan, Lt. Gen. Riccardo MARCHIO’ represented the NRDC-ITA during the presentation of the book “Soldiers of peace”. 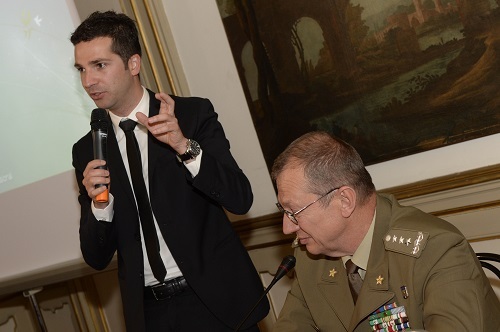 The author, Vincenzo RUBANO, a young Italian journalist, wrote a diary of his extraordinary experience after two tours spent in Afghanistan embedded with Italian Army soldiers, in 2011-2012. At that time ISAF RC-W (Regional Command West), now TAAC-W (Train Advise Assist Command West), was under Italian responsibility, and the provinces of Badghis, Farah, Ghor and Herat were part of it. “Vincenzo Rubano” – Lt. Gen. Marchiò said – “witnesses the great commitment of our soldiers and highlighted in his book the humble and hard work they made, sometimes at the ultimate sacrifice, in support of peace process in Afghanistan. Today, in the day the Italian Army celebrates its 155th anniversary, our thoughts are for those who served: we remember our fallen”.